Who will be Trump's secretary of defense? President-elect Donald Trump's surprise victory this week has left defense watchers scrambling to figure out who will take over key national security posts next year, including defense secretarySecretary of Defense​. Many traditional names for Republican candidates are off the table, either because of past conflicts with the controversial business mogul or their disconnect from his non-traditional campaign. Party officials for months have questioned exactly who help Trump craft his national security policies, and have received only partial answers. Trump's thin bench is a stark contrast with Hillary Clinton's reservoir of old hands. "You look at (Hillary Clinton's) campaign, and you basically had a [defense] secretary in waiting, and well below that was mapped out," said Justin Johnson, a defense expert with the Heritage Foundation. "Trump has operated by a different paradigm, not coming from the same Washington establishment, with the usual alliances and payback required." Among the most prominent names in his defense inner circle are Republican Alabama Sen. Jeff Sessions and former Defense Intelligence Agency Director Mike Flynn, two key advisers to Trump throughout the campaign. Trump has hinted at a top defense job for Flynn, but the retired Army lieutenant general is not eligible to take over the top Pentagon post for five more years due to his military service. But he could get a waiver from Congress to serve in the post, or step into a host of other prominent roles, such as CIA director. 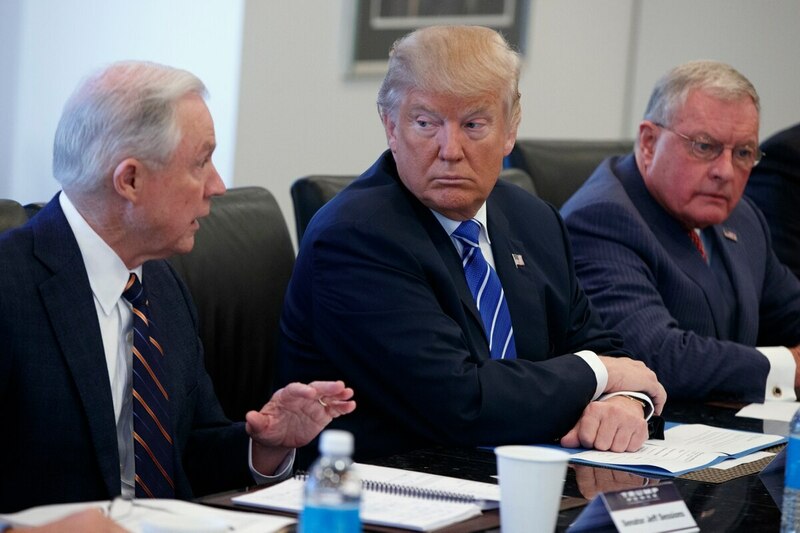 Sessions name has also surfaced frequently, but the four-term senator may be more valuable to Trump -- who boasts no prior experience in elected office -- as an ally in the Congress. Pundits have also pointed to Stephen Hadley, national security adviser to President George W. Bush, as another potential candidate, especially in recent months as he has stayed out of the public debate over whether Republicans should back their nominee. Prominent Republicans, including radio host Hugh Hewitt, have also pushed former Missouri Senator Jim Talent as a potential defense secretary pick. In recent years, Talent has worked at the conservative American Enterprise Institute as part of a team working on defense budgeting reform. Those choices all fall within the realm of expected and somewhat predictable options, and Trump throughout the campaign has shown a penchant for unexpected moves. But while he has espoused ideas outside the mainstream, Trump will be faced with a divided nation and limited political capital. "He can't do it all, so is it Obamacare, defense, border security, tax relief? There are a whole bunch of things, but you can maybe do three," said Mark Cancian, of the Center for Strategic and International Studies. Cancian expected Trump to bring in people from outside government, yet to be named. "That can be good; there are a lot of talented people out there, but it comes with a lot of risk," Cancian said. "It's easy for those people to get cross-wise with the expectations of public service, to say things and do things that are embarrassing. ... Government is a craft and people need to know what they're doing." Republican Reps. Mike Rogers of Alabama, Duncan Hunter of California and Randy Forbes of Virginia have all been seen as close congressional allies to Trump, and could be in line to take over lower-level defense posts such as service secretaries. Trump campaign officials said that retired Army Lt. Gen. Keith Kellogg and Army Reserve Maj. Gen. Bert Mizusawa -- who have worked closely with Flynn on campaign policy issues -- may also be in line for similar roles. Retiring Florida Republican Rep. Jeff Miller, one of Trump’s closest advisers on veterans issues, could be in line for a key job in the Department of Veterans Affairs. Trump will also be able to pull advisers and appointees from a variety of Republican think tanks in Washington, D.C., though many leaders of those organizations also had ties to the "Never Trump" movement that unsuccessfully tried to label the president-elect as an unstable pick as commander in chief. One organization that did enjoy close ties to Trump was the conservative Heritage Foundation, giving staffers there an inside path to becoming part of the administration. One problem Trump shouldn’t have in appointing his defense team is getting them confirmed by the Senate. Republicans managed to hold onto the chamber by a small margin on Election Day, simplifying the process of vetting and approving the nominees.